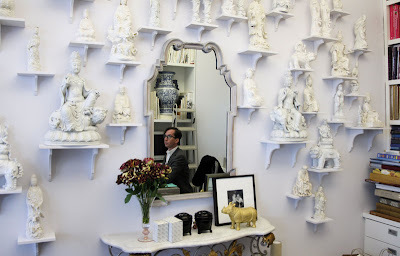 San Francisco interior designer, blogger, and man about town Grant Gibson was sweet to email me to remind me about this extraordinary Chinoiserie office. 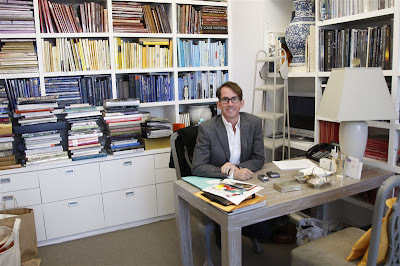 It is the office of Kevin Sharkey, Martha Stewart VP and Director of Marketing and was featured in Martha Stewart Living. The wall of Blanc de Chine statues is amazing, isn't it? 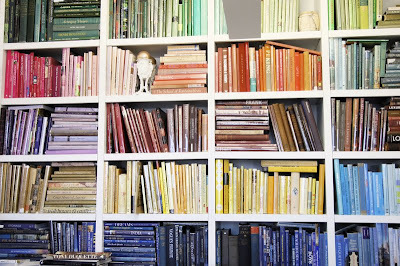 The books are organized by color. Some people might have trouble finding things, but I think I would get to know where everything is-what a gorgeous look. Notice too the Faux Bois parson's desk and the gray Chippendale chairs. This is definitely a stunning office. One of these days I will show you my Chinoiserie office with my love of "singerie." If anyone knows what singerie is, without looking it up, you don't have to read this blog anymore-you have passed "Chinoiserie" with an "A." Click here to see another gorgeous Chinoiserie office I featured. Maybe this will motivate you to incorporate some Chinoiserie touches in your office. For a fabulous budget friendly idea I posted on, click here. Fabulous - oh if only my bookcases could look like his! Stunning. All the blanc de Chine on the wall looks positively sculptural. Absolutely stunning. I LOVE the more is more look. And I'm a huge fan of this style of book display - as I've collected more over the years, I've taken to displaying them by color rather than subject. I really like the effect, and somehow, I still remember where things are ("I think that book of poetry had a yellow binding..."). My only caveat on the blanc de chine statues is that I would have to hire someone to dust them with... a blow-dryer? lol. a.-It's gorgeous and just think of how good it would be for the memory remembering the color of each book! Averill-How about a wall like this in the new house! SF-A beautiful feather duster would be fun to dust them. I am going to think about this book by color idea-I thinks it's beautiful! Sanity Fair, you make me laugh! This is a great post - and I adore the display of books! Alicia-I agree, but it's so pretty it might be worth it. I just felt the truth of the cliché: Life is Not Fair when I saw this office! MLHP-It would be tough to match this! Simply a gorgeous collection of reading material! Tea or Wine-I am motivated to reshelve all my books.